A lot is being talked regarding Indigo kids lately since they have increased in number but has there been something spoken about the adults? It is true that the occurrence of Indigo people is not recent, they have been around for several years and as a consequence, we have an ample number of adults also. 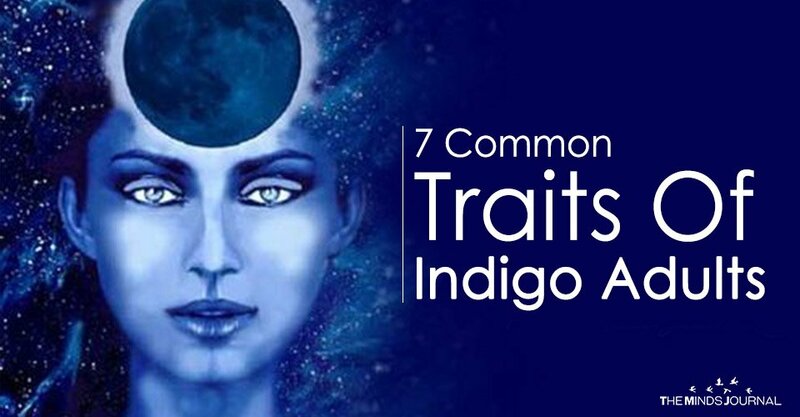 You can know if you are an Indigo person by evaluating yourself under the following signs. It is very hard for an Indigo to be okay with not knowing the background story of the things that happen around them. They desperately seek to comprehend certain globally prevalent issues like disparity, poverty, hatred, and conflicts, struggling to digest the inhumanity of humans. These gaps in reasoning trouble the Indigo adults and therefore they just end up questioning everything. Amongst several other things, what Indigo adults often find it hard to ignore is an authority. They don’t believe that a person can never be wrong and hence they criticize how every common man’s life is ridiculously controlled by a few men who are in power. Even at a young age, there is a possibility that an Indigo’s time was not as pleasant at school quarreling over their protocols. So many a times, they would be perceived as rebellious and an agitator no matter how pure their intentions may be. They cannot just stop themselves from calling wrong, what’s wrong. These issues can lead to them turning indifferent to all these social and political regimes. Furthermore, creating new organizations is what’s usually preferred by them rather than spending time and energy on repairing, amending the existing ones. They actively participate in addressing to the masses in order to spread awareness and help people see what they see. Indigos are the ultimate empaths. They need not make a conscious effort in order to empathize with someone. Due to this, they generally don’t spend time in getting the whereabouts of the world not because they are ignorant but because it is just not as simple for them to watch something wrong happen and do nothing about it. Although, it is not practically feasible for one person to take care of every problem the world has. Indigos care about others so much that watching someone blameless suffer can cause them emotional pain, literally. And for the situations where something can be done to make it right, it becomes unbearable to them seeing that no steps are being taken to help. The helplessness just gets to them. Indigos have a deep connection with both flora and fauna. Empathizing with animals come as naturally as breathing to them. Their notion of inequality is not just limited to humans. They want to see every creature to be treated equally, having the right to live with dignity. Seeing how naïve and oblivious to the world animals are, they always make sure to protect and fight for their interests and even rescue them whenever possible. Not only do they love spending time in the fresh environment and living close to nature, they also are huge National Geographic and Discovery Channel fans. There is nothing more satisfying to them than watching animals and forests living peacefully in harmony. While going through the tough time of assimilating humans’ greed and all the harm they bring to one another, it doesn’t come across as a surprise that their helplessness and ability to feel others’ pain leads them to spiral into problems like depression. It often occurs to them early during the adolescence age of can also take some time. The fact that most of us are power hungry and covetous makes them feel hard to fit into the society at times while they themselves find it hard to relate to their actions. Having experienced so much dirt and ugliness in life, as their character would allow, they may even begin to question why does life exist at all, what is the point of taking birth just so that we could get destroyed someday. However, once they find a purpose in their life, they rise above the issues and become potentially capable of bringing about a huge difference in the world. 6. You have experienced a few uncommon mystical happenings. Indigos can be very inclined towards spirituality before age, leaving the people around them astonished. They are devotees of Gods and like spending time praying and worshiping Gods even when they come from a background of a non-religious family. Their spiritual side grows with time until they reach maturity. Although their approach is more spiritual than religious, they often have supernatural encounters and have at least once in their lives felt the presence of a different dimension of reality. There is one other thing that they have a special connection with, the time 11:11. An Indigo would notice whenever the clock hits that time. The feeling of listlessness and lethargy can very easily come to Indigo adults, which is why in order to keep their act together they are on a mission to find their life’s purpose. Usually, people devote their time and energies towards becoming more and more successful and progress in their professional careers, whereas, Indigos have a clear objective of making the world a better place to live, especially for the future generations. Nevertheless, finding a purpose is not a walk in the park for them. This can lead to frustration within the Indigo person who feels this deep need to achieve their potential but cannot find the structures to support them in this desire.